South Africa is one of the incredibly popular immigrant destinations that offer umpteen number of career and employment prospects to its applicants. With the steady rise in economy and manufacturing sector, South Africa is experiencing a shortage of skilled workers in diverse fields. South Africa has many visa options for skilled applicants who wish to settle and work such as jobseeker visa and work visa that would be helpful for an individual to fulfill their career aspirations. An overseas skilled worker mulling to migrate to South Africa can make use of the work visa of the country to settle in the country at a faster pace. Alongside its sizeable number of job prospects, this renowned destination is also widely known for resplendent natural attractions and stupendous landscapes. Every year thousands of individuals from across the globe flock to this vibrant cultured and prosperous nation to come across astonishing solid business ambience and high quality of life. This special visa category is applicable for skilled professionals who possess special prowess and have the ability to work for country’s economy. An individual aspiring to immigrate to their dream destination through critical skills visa of South Africa must meet the required qualifications of the country. Few of the added advantages for skilled applicants who make use of this visa category is that, overseas individuals with valid job offer letter are likely to be offered with five year critical visa and those without relevant employment offer is granted one year work visa. An interesting fact about this work visa is that skilled applicant will have an opportunity to accompany their common law partner and dependent child for the duration that coincides with the duration of prospective critical visa holder. This special visa option lets an overseas skilled applicant to stay in the country for 12 months till they attain the confirmed employment letter. Prospective visa holder will have no constraints to move between the employers. 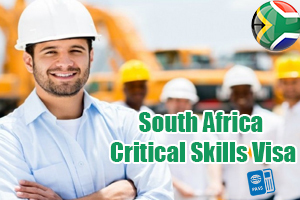 Therefore, if you are satisfying all the above stated requirements and holds experience that is on par with the requirements of South Africa, you can apply for South Africa Critical Skills Visa. Are there any stipulations for apply South Africa Business visa?